In 1954, the U.S. Atomic Energy Commission (AEC) began a program to encourage the private reprocessing of spent nuclear fuel as part of a program to commercialize the nuclear fuel cycle. New York State became interested in the AEC privatization program as a way to promote industrial development within the State. By 1961, New York State’s Office of Atomic Development acquired 3,345 acres in the Town of Ashford within Cattaraugus County, New York with the intent of establishing a spent fuel reprocessing facility. The AEC announcement also created interest within the business community, and the Davison Chemical Company set up Nuclear Fuel Services Inc. (NFS) to pursue the spent fuel reprocessing venture. Negotiations among NFS, AEC, and New York State on the operation of the plant were completed in 1962, and construction began in 1963. The plant was completed in 1966 at a cost of about $33 million. NFS was licensed as the operator, and the New York State Atomic Research and Development Authority (a predecessor agency of the New York State Energy Research and Development Authority) was licensed as the owner. NFS reprocessed 640 metric tons of spent fuel between 1966 and 1971. Sixty percent of this fuel was from the N-reactor at Hanford – supplied by AEC under a baseload contract with NFS. During the time it operated, the facility experienced operational difficulties, higher than expected worker doses, and unplanned releases of radioactive material to the environment. In addition to spent fuel reprocessing, NFS established two radioactive waste disposal areas at the Center – a commercial radioactive waste disposal facility, and a separate facility that was used for the disposal of high-activity reprocessing waste with radiation levels that were too high to be buried in the commercial disposal facility. The commercial wastes were accepted for disposal until 1975. After operating the facility for six years, NFS halted reprocessing operations in 1972 in order to make modifications to the plant. NFS expected that these modifications would cost $15 million. During the shut-down period, new regulatory requirements were issued by the AEC related to earthquake and tornado protection and waste management. NFS estimated that meeting these new requirements could cost $600 million, and NFS informed New York that it was withdrawing from the reprocessing business and intended to turn the facility over to the State. At that time, the facility contained 750 spent fuel assemblies that had not been reprocessed, 600,000 gallons of liquid high-level radioactive waste (HLW) stored in steel tanks, the highly contaminated Main Plant Process Building, and two radioactive waste disposal areas that contained almost 3 million cubic feet of waste. New York State refused to take possession of the facility because the perpetual care fund that had been accumulated by NFS (less than $4 million) was inadequate to care for the facilities. Congress held hearings, directed the GAO to investigate the issues, and directed DOE to study options for the future of the Center. These activities eventually led to Congress passing the West Valley Demonstration Project Act in 1980. In 1980, in accordance with the West Valley Demonstration Project Act, the U.S. Department of Energy (DOE) took the lead in solidifying the liquid HLW wastes, and in decontaminating and decommissioning the facilities used in the solidification project. 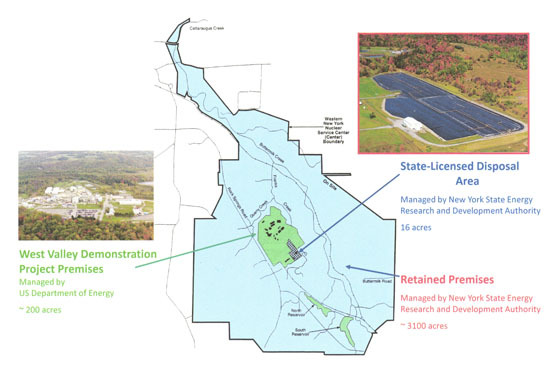 The New York State Energy Research and Development Authority (NYSERDA) is responsible for management of the shut down commercial radioactive waste disposal site and the balance of the Center. NYSERDA, as the owner, is also the licensee for the site. In 1996 DOE and NYSERDA jointly issued a draft Environmental Impact Statement (EIS) which contained no preferred alternative for site cleanup and decommissioning. Numerous comments were received and the agencies agreed to issue a revised draft with a preferred alternative. The West Valley Citizen Task Force (CTF) was formed in 1997 to provide broader public participation in the EIS and decontamination and decommissioning processes. The CTF issued a report in 1998 addressing what it felt should occur and has been meeting regularly since then. Members of the CTF are drawn from local government, community and environmental organizations, representatives of elected officials and the Seneca Nation of Indians. 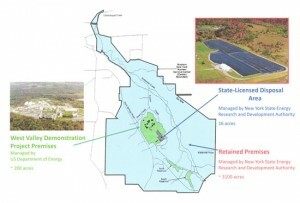 Another Draft EIS was released for public comment in November 2008. The Decommissioning Plan was also delivered to NRC in December 2008. A Final EIS, Record of Decision and New York Finding Statement were released in the spring of 2010. A phased decisionmaking approach was selected. Phase 1 of decommissioning activities is underway. The core of that work will be the relocation of 275 HLW canisters to a new on-site interim storage system; demolition and removal of the Main Plant Process Building, Vitrification Facility, and the source of the North Plateau Groundwater Plume; removal of the low-level waste water treatment system, the four operating lagoons, and one closed lagoon; shipment and disposal of all of the project-generated low-level waste and transuranic waste; and removal of numerous ancillary facilities. In order to assist DOE and NYSERDA in resolving some technical issues identified in the EIS and arriving at a Phase 2 decision, a Phase 1 Studies Process was agreed upon with subject matter experts engaged and an Independent Scientific Panel formed. In addition to the Phase 2 decision, there remain questions about the ultimate disposal pathway for the high-level radioactive waste at the site.